It certainly didn't help that the Surface Go was rarely discounted, unlike the Surface Pro 6 that's constantly on sale at lower than usual prices. But at long last, it seems the deals are piling up as far as the more compact Windows 10 tablet is concerned, as Amazon today follows the suit of a top-rated eBay seller from a few weeks back. This time around, the device is on special offer by itself, so if you want to expand its standard capabilities, you'll need to separately purchase Microsoft's Surface Go Type Cover keyboard and Surface Pen. It's also worth pointing out that the 4GB RAM/128GB SSD configuration is the only one marked down at the time of this writing, fetching 100 bucks less than usual, which represents a cool savings of 20 percent off this variant's list price. Basically, you can now buy a Surface Go with a 128 gig solid-state drive at no extra charge compared to the 64GB model, which happens to come with eMMC storage rather than a speedy SSD. That makes this tablet configuration on sale today significantly faster than an entry-level version, while naturally accommodating twice as much data internally as well. 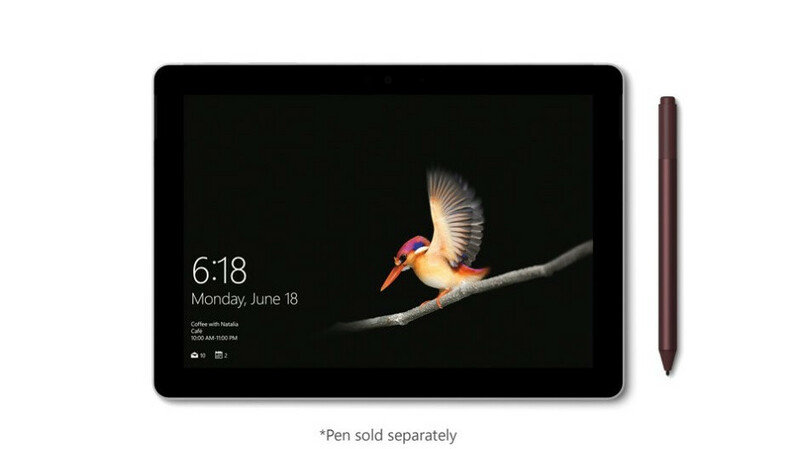 The Microsoft Surface Go can be a pretty great alternative for the likes of the Samsung Galaxy Tab S5e and iPad (2018), further packing an Intel Pentium "Gold" processor that can squeeze up to 9 hours of battery life out of a mobile computing system also sporting a sharp "PixelSense" display with 1800 x 1200 resolution. The only thing that might give you pause here is that Amazon doesn't actually sell the discounted tablet itself. But the e-commerce giant does promise to fulfill your orders, while Etech Galaxy looks like a very trustworthy third-party seller, based on its 96 percent positive rating score.